Here’s a simple tip for making sure web email address in print look more professional; I’ve been doing this for years now. When typing an email address into your document, what I have found is the “@” symbol sits on the baseline by default (in the majority of fonts). In the example above, I have demonstrated that simply by shifting the baseline lower on the “@” symbol, the whole aesthetics of the typography looks a whole lot better. 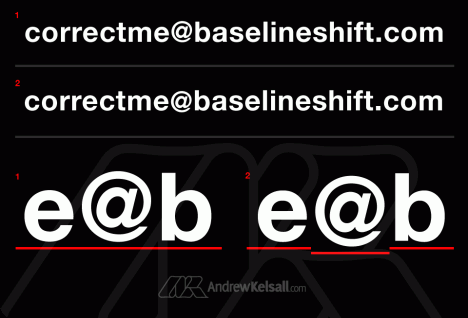 Number 1 shows the email address without baseline shift correction, whilst number 2 shows the corrected version. (Technical tip: the baseline shift should be set to a few negative-points (depending on letter size) using the character pallet in Illustrator, Photoshop, etc). I also adjust the baseline shift on brackets, too. Simple and very effective, nice tip! Thanks for sharing.